This is old version Ace Fishing: Wild Catch 2.2.9 apk for Android, you can install it if you want to downgrade or install old app. It is top Sports apps from Com2uS USA. You can also get fishing equipment such as fishing rods which can be customized with various length and strength of fishing lines and become professional like fisherman. If you are able to catch the biggest fish, you can break the records in this game. 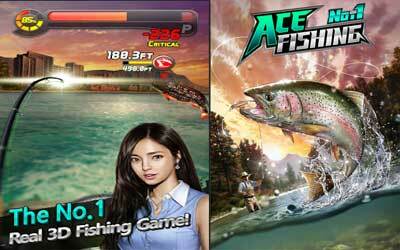 The Ace Fishing game comes in 3D to experience the lifelikeness as possible of your prey and place for fishing. The developers of the game have created a satisfied game to explore the fishing activity. This sport game for Android provides the beautiful journey in plenty different destinations. You can attest your fishing skill by visiting many tropical islands until each corners of the world includes Yangtze River in China, the Amazon River, and many more. Sooner, the Ace Fishing: Wild Catch for Android will be updated to allow you fish against your friends and other fishermen. It doesn’t get any more real than this!